The Eastman Percussion Ensemble is comprised of upperclassmen and graduate percussion students of the Eastman School of Music. Its repertoire ranges from contemporary genres to world music and improvisation. The Ensemble is an integral part of the percussion curriculum at Eastman, presenting five on-campus concerts per year as well as numerous off-campus performances. 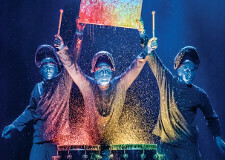 The ensemble was a winner in the International Percussion Ensemble Competition in 2013 and performed at the Percussive Arts Society International Convention in that year. In addition the group performed the opening concert at the Perkumania Festival at the Paris Conservatory in 2009 and at the Kennedy Center as part of the Conservatory Project in 2011. Guest artists that have appeared with group include Steven Schick, Anders Astrand, Bob Becker, Glenn Kotche, Jan Williams and Blake Tyson. The ensemble has commissoned and premiered works from composers such as John Psathas, Alejandro Viñao, James Wood, Ivan Trevino, Matthew Curlee, and David Liptak.